Pinched shoulder nerve is a very common condition affecting many people around the world. Know all about this medical syndrome including its causes, symptoms, diagnosis and treatment. What is Pinched Nerve in Shoulder? What Causes Pinched Nerve in Shoulder? How to Treat a Pinched Nerve in shoulder? How to heal a Pinched Nerve in Shoulder with Acupuncture and Acupressure? It is a condition in which some nerves in the shoulder are compressed leading to pain and other discomforting symptoms. This is a very uncomfortable condition which can disrupt normal activities and lead to soreness in the shoulder. This condition typically arises when the shoulder nerve is under too much stress from the surrounding tissue, tendons, muscles, bones and cartilage. This increased pressure is the result of neighboring tissues that are extremely constricted or stretched. Overstretching of shoulder tissues generally occurs while lifting heavy objects, sitting in a slouched posture or sleeping in a bad position. This is the main symptom of Pinched Nerve in Shoulder. Pain usually arises in only one particular area of the shoulder and gradually spreads to surrounding regions in the later stages. 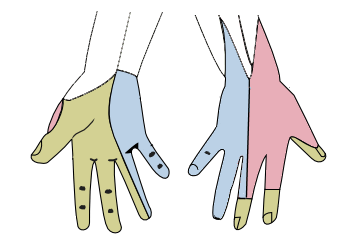 The intensity of the Pinched Nerve shoulder arm pain depends on which nerve has been pinched. A pinched shoulder nerve also leads to a tingling sensation. This sensation persists at all times of the day. Pain is accompanied by numbness or a lack of sensation in the later stages. The numbness may be partial or total. Complete lack of sensation usually happens in later stages of the condition. You may feel as though you have lost your shoulder. The condition also leads to weakness in the shoulder muscles. This happens because one or more muscles adjacent to the pinched nerve become compressed. In many cases, twitching and cramps occur in muscles in the shoulder causing further discomfort to patients. In later stages, there is swelling in the affected nerve region. The inflammation increases with strenuous activities such as lifting and can be visible from the outside. Rest is most essential for Pinched Nerve Shoulder treatment. It is necessary to avoid strenuous activities such as weightlifting and carrying heavy objects. All types of activities that put shoulder under stress should be avoided. If increased pressure on the area leads to swelling, anti-inflammatory medicines such as Ibuprofen and Naproxen may be prescribed by doctors. These medicines can be purchased from supermarkets and drugstores without prescription. If your shoulder pinched nerve pain lasts even after taking these non-prescription drugs, your doctor may use a corticosteroid injection to reduce inflammation. If pain persists for about a week, more intensive treatment such as physical therapy may be needed. Physical therapy includes a system of stretches and exercises that reduce pressure on the affected nerves. Therapy should always be conducted by an experienced professional therapist. Some patients may get cured after a single therapy session while others need multiple therapies before their impacted nerve or nerves start showing improvement. In some cases, a splint or brace is necessary to support the shoulder region surrounding the pinched nerve. This protects the area from further injury and prevents greater damage to the nerve as well as the adjacent tissues, muscles and ligaments. Acupuncture and Acupressure are very useful in releasing blockages in the meridian channel and bringing back energy flow. An obstruction in the meridian channel leads to inflammation which can cause nerve compression. Restoring energy flow helps relax the tissues adjacent to the affected nerve. In the absence of pressure from surrounding tissues, the affected nerve proceeds towards normalcy. It is important to remember that treatment does not directly cure the pinched nerve itself. The aim of medications, massages, therapies and other remedies is to address the ligaments, tissues and muscles next to the affected nerve. If in spite of therapies and medications for shoulder pain pinched nerve persists, a surgery may be needed. This is done only in cases where the condition lasts for months and shows no improvement to other methods of treatment. A persisting pinched shoulder nerve may be a result of a herniated disc, a torn carpel ligament or bone spurs. It may also be caused by a wrongly aligned spinal disc. Surgical intervention corrects these conditions and cures pinched nerve. A surgery is enough to correct spinal misalignment. While pinched shoulder nerve surgery has a high success rate, it may also give rise to some health risks. Due to this, it is usually done as a last resort when other treatment methods have failed. Obese people are at high risk of suffering from this disorder. If you are overweight, exercise regularly to get an ideal weight. A bad body posture while sitting or sleeping can also result in a pinched nerve. Try to maintain a good body posture at all times. Walk and sit straight with your spine erect and sleep with normal placement of limbs to prevent pinched nerve in the shoulder. Yoga and stretching exercises flex your body muscles and make them supple. This allows your shoulder nerves to withstand minor stretches and pressure while performing strenuous activities. However, you should take care not to stretch yourself too much as over-stretching also gives rise to a pinched nerve. Try to avoid activities that repeatedly put your shoulder under stress. This involves holding heavy objects such as briefcase, bags and weights for a long time. 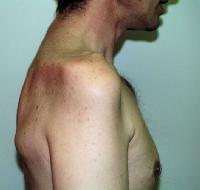 With effective treatment for a pinched nerve in shoulder, this condition gets cured in a few weeks. Remedy for this disorder has a high success rate. Treatment has to be supported with good posture, regular exercise, avoiding carrying heavy weights and other lifestyle modifications to help long term treatment and also prevent recurrence of the condition. This condition arises when a nerve in the shoulder blade gets affected due to pressure from the surrounding tissues. People suffering from this problem experience symptoms like pain, prickling sensation, muscle spasm and fatigue in the deltoid muscles. The affected arm also becomes too weak for movement. If you suspect yourself or any of your family members to be suffering from this condition, do not delay treatment. Visit a doctor and seek proper medical treatment. Ignoring the condition may affect your arm usage and cause many other discomforts. Early treatment can prevent all such complications and help you get back to normalcy in only a few weeks.